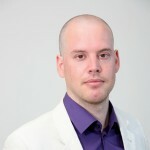 Dr. Tjerk Jan Schuitmaker is assistant professor at the Athena Institute of the VU University Amsterdam. He teaches a wide range of courses. He is interested in persistent problems and system innovations in health care. An underlying goal is to improve the relationship between patient and professionals central in the quest for high quality care. This requires empowerment of both professionals and patients. He has, for instance, worked with regional partnerships of health care professionals in obstetrics on improving the quality and continuity of (pre)natal care, and with patients in implementing sustainable patient engagement practices in oncological care. His dissertation is about persistent problems in the Dutch Health Care System. He conducted this research at the AISSR of the University of Amsterdam, as part of the KSI-network, dealing with sustainability transitions. Besides these activities he likes to produce (cuddly) film, (location) theatre and music. Voor de Nederlandse versie, klik hier.